Russians in Ukraine (Ukrainian: Росіяни в Україні, Rosiyany v Ukrayini; Russian: Русские на Украине, Russkiye na Ukrainye) — the largest ethnic minority in the country, which community forms the largest single Russian diaspora in the world. In the 2001 Ukrainian census, 8,334,100 identified as ethnic Russians (17.3% of the population of Ukraine), this is the combined figure for persons originating from outside of Ukraine and the native population declaring Russian ethnicity. According to the 2001 Ukrainian Census the percentage of Russian population tends to be higher in the east and south in the country. Ethnic Russians live throughout Ukraine. They comprise a notable fraction of the overall population in the east and south, a significant minority in the center, and larger minority in the west. The west and the center of the country feature a higher percentage of Russians in cities and industrial centers and much smaller percentage in the overwhelmingly Ukrainophone rural areas. Due to the concentration of the Russians in the cities, as well as for historic reasons, most of the largest cities in the center and the south-east of the country (including Kiev where Russians amount to 13.1% of the population) remained largely Russophone as of 2003. Traditionally mixed Russo-Ukrainian populated territories are mainly historic Novorossiya (New Russia) and Sloboda Ukraine - now both split between the Russian Federation and Ukraine. Russians constitute the majority in the Crimea (71.7% in Sevastopol and 58,5% in the Autonomous republic of Crimea), the southern peninsula which the Soviet government transferred from the Russian SFSR to the Ukrainian SSR in 1954. However outside the Crimea, Russians are the largest ethnic group in only a tiny handful of units: Donetsk (48.2%) and Makiyivka (50.8%) in Donetsk Oblast, Ternivka (52.9%) in Dnipropetrovsk Oblast, Krasnodon (63.3%) and Sverdlovsk (58.7%) and Krasnodonskyi raion (51.7%) and Stanychno-Luhanskyi (61.1%) raion in Luhansk Oblast, Reni (70,54%) and Izmail (43.7%) in Odessa oblast, Putyvl Raion (51.6%) in Sumy Oblast. One of the most prominent Russians in the Medieval Ukraine (at that time Polish-Lithuanian Commonwealth) was Ivan Fyodorov who published the Ostrog Bible and called himself a Muscovite. In 1599 Tsar Boris Godunov ordered the construction of Tsareborisov on the banks of Oskol River, the first city and the first fortress in Eastern Ukraine. To defend the territory from Tatar raids the Russians built the Belgorod defensive line (1635–1658), and Ukrainians started fleeing to be under its defense. More Russian speakers appeared in northern, central and eastern Ukrainian territories during the late 17th century, following the Cossack Rebellion led by Bohdan Khmelnytsky. The Uprising led to a massive movement of Ukrainian settlers to the Sloboda Ukraine region, which converted it from a sparsely inhabited frontier area to one of the major populated regions of the Tsardom of Russia. Following the Treaty of Pereyaslav, Ukrainian Cossacks lands, including the modern northern and eastern parts of Ukraine became a protectorate of the into the Tsardom of Russia. This brought the first significant, but still small, wave of Russian settlers into central Ukraine (primarily several thousand soldiers stationed in garrisons, out of a population of approximately 1.2 million non-Russians). At the end of the 18th century, the Russian Empire captured large uninhabited steppe territories from the former Crimean Khanate. The systematic colonization of lands in what became known as Novorossiya (mainly Crimea, Taurida and around Odessa) began. Migrants from many ethnic groups (predominantly Ukrainians and Russians from Russia proper) came to this area. At the same time the discovery of coal in the Donets Basin also marked the commencement of a large-scale industrialization and an influx of workers from other parts of the Russian Empire. 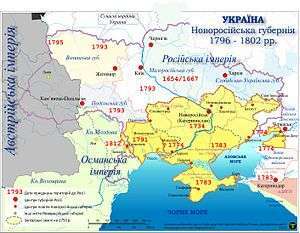 Nearly all of the major cities of the southern and eastern Ukraine were established in this period: Aleksandrovsk (now Zaporizhia; 1770), Yekaterinoslav (now Dnipropetrovsk; 1776), Kherson and Mariupol (1778), Sevastopol (1783), Simferopol and Novoaleksandrovka (Melitopol) (1784), Nikolayev (Mykolaiv; 1789), Odessa (1794), Lugansk (Luhansk; foundation of Luhansk plant in 1795). Both Russians and Ukrainians made up the bulk of the migrants — 31.8% and 42.0% respectively. The population of Novorossiya eventually became intermixed, and with Russification being the state policy, the Russian identity dominated in mixed families and communities. The Russian Empire officially regarded Ukrainians, Russians and Belarusians as Little, Great and White Russians, which, according to the theory officially accepted in the Imperial Russia, belonged to a single Russian nation, the descendants of the people of the Rus'. In the beginning of the 20th century the Russians were the largest ethnic group in the following cities: Kiev (54,2%), Kharkov (63,1%), Odessa (49,09%), Nikolaev (66,33%), Mariupol (63,22%), Lugansk (68,16%), Berdiansk (66,05%), Kherson (47,21%), Melitopol (42,8%), Yekaterinoslav (41,78%), Yelisavetgrad (34,64%), Pavlograd (34,36%), Simferopol (45,64%), Feodosiya (46,84%), Yalta (66,17%), Kerch (57,8%), Sevastopol (63,46%), Cuguev (86%). The first Russian Empire Census, conducted in 1897, showed extensive usage (and in some cases dominance) of the Little Russian, a contemporary term for the Ukrainian language, in the nine south-western Governorates and the Kuban. Thus, when the Central Rada officials were outlining the future borders of the new Ukrainian state they took the results of the census in regards to the language and religion as determining factors. The ethnographic borders of Ukraine thus turned out to be almost twice as large as the original Bohdan Khmelnytsky State incorporated into Russian Empire during 17-18th centuries. During the World War I, strong national movement managed to obtain some autonomous rights from the Russian government in Saint Petersburg. However, the October Revolution brought big changes for the new Russian Republic. Ukraine became a battleground between the two main Russian war factions during the Russian Civil War (1918–1922), the Communist Reds (Red Army) and the Monarchist Whites (Volunteer Army). The October Revolution also found its echo amongst the extensive working class, and several Soviet Republics were formed by Bolsheviks in Ukraine: the Ukrainian People's Socialist Republic, Soviet Socialist Republic of Taurida, Odessa Soviet Republic and the Donetsk-Krivoy Rog Republic. The Russian SFSR government supported military intervention against the Ukrainian People's Republic, which at different periods controlled most of the territory of present-day Ukraine with the exception of Crimea and Western Ukraine. Although there were differences between Ukrainian Bolsheviks initially, which resulted in proclamation of several Soviet Republics in 1917, later, due in large part to pressure from Vladimir Lenin and other Bolshevik leaders, one Ukrainian Soviet Socialist Republic was proclaimed. The Ukrainian SSR was de jure a separate state until the formation of the USSR in 1922 and survived until the breakup of the Soviet Union in 1991. Lenin insisted that ignoring the national question in Ukraine would endanger the support of the Revolution among the Ukrainian population and thus new borders of Soviet Ukraine were established to the extent that the Ukrainian People's Republic was claiming in 1918. The new borders completely included Novorossiya (including the short-lived Donetsk-Krivoy Rog Soviet Republic) and other neighboring provinces, which contained a substantial number of ethnic Russians. In his 1923 speech devoted to the national and ethnic issues in the party and state affairs, Joseph Stalin identified several obstacles in implementing the national program of the party. Those were the "dominant-nation chauvinism", "economic and cultural inequality" of the nationalities and the "survivals of nationalism among a number of nations which have borne the heavy yoke of national oppression". In Ukraine's case, both threats came, respectfully, from the south and the east: Novorossiya with its historically strong Russian cultural influence, and the traditional Ukrainian center and west. These considerations brought about a policy of Ukrainization, to simultaneously break the remains of the Great Russian attitude and to gain popularity among the Ukrainian population, thus recognizing their dominance of the republic. Ukrainian language was mandatory for most jobs, and its teaching became compulsory in every school. By the early-1930s attitudes towards the policy of Ukrainization had changed within the Soviet leadership. In 1933 Stalin declared that local nationalism was the main threat to Soviet unity. Consequently, many changes introduced during the Ukrainization period were reversed: Russian language schools, libraries and newspapers were restored and even increased in number. Changes were brought territorially as well, forcing the Ukrainian SSR to cede some territories to the RSFSR. Thousands of ethnic Ukrainians were deported to the far east of the Soviet Union, numerous villages with Ukrainian majority were eliminated with Holodomor, while remaining Ukrainians were subjected to discrimination. During this period parents in the Ukrainian SSR could choose to send their children whose native language was not Ukrainian to schools with Russian as the primary language of instruction. The territory of Ukraine was a battlefield during the World War II, and its population, including Russians, significantly decreased. The infrastructure was heavily damaged and it required human and capital resources to be rebuilt. This compounded with depopulation caused by two famines of 1931–1932 and a third in 1947 to leave the territory with a greatly reduced population. A large portion of the wave of new migrants to industrialize, integrate and Sovietize the recently acquired western Ukrainian territories were ethnic Russians who mostly settled around industrial centers and military garrisons. This increased the proportion of the Russian speaking population. Near the end of the War, the entire population of Crimean Tatars (numbering up to a quarter of a million) was expelled from their homeland in Crimea to Central Asia, under accusations of collaborations with Germans. The Crimea was repopulated by the new wave of Russian and Ukrainian settlers and the Russian proportion of the population of Crimea went up significantly (from 47.7% in 1937 to 61.6% in 1993) and the Ukrainian proportion doubled (12.8% in 1937 and 23.6% in 1993). The Ukrainian language remained a mandatory subject of study in all Russian schools, but in many government offices preference was given to the Russian language that gave an additional impetus to the advancement of Russification. The 1979 census showed that only one third of ethnic Russians spoke the Ukrainian language fluently. In 1954, the Presidium of the Supreme Soviet of the USSR issued the decree on the transfer of the Crimean Oblast from the Russian SFSR to the Ukrainian SSR. This action increased the ethnic Russian population of Ukraine by almost a million people. Many Russian politicians considered the transfer to be controversial. Controversies and legality of the transfer remained a sore point in relations between Ukraine and Russia for a few years, and in particular in the internal politics in Crimea. However, in a 1997 treaty between the Russian Federation and Ukraine, Russia recognized Ukraine's borders and accepted Ukraine's sovereignty over Crimea. 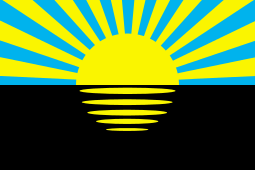 Following the dissolution of the Soviet Union, Ukraine became an independent state. This independence was supported by the referendum in all regions of Ukrainian SSR, including those with large Russian populations. A study of the National Academy of Sciences of Ukraine found that in 1991, 75% of ethnic Russians in Ukraine no longer identified themselves with the Russian nation. In the December 1991 Ukrainian independence referendum 55% of the ethnic Russians in Ukraine voted for independence. The return of Crimean Tatars has resulted in several high-profile clashes over land ownership and employment rights. In 1994 a referendum took place in the Donetsk Oblast and the Luhansk Oblast, with around 90% supporting the Russian language gaining status of an official language alongside Ukrainian, and for the Russian language to be an official language on a regional level; however, the referendum was annulled by the Kiev government. Currently many ethnic Russians in Ukraine feel pressured by the state policy of Ukrainization. Much controversy has surrounded the reduction of schools with Russian as their main language of instruction. In 1989, there were 4633 schools with Russian as the main instruction language, and by 2001 this number fell to 2001 schools or 11.8% of the total in the country. A significant number of these Russian schools were converted into schools in with both Russian and Ukrainian language classes. By 2007, 20% of pupils in public schools studied in Russian classes. Some regions such as Rivne Oblast have no schools with Russian only instruction left, but only Russian classes provided in the mixed Russian-Ukrainian schools. As of May, 2007, only seven schools with Russian as the main language of instruction are left in Kiev, with 17 more mixed language schools totaling 8,000 pupils, with the rest of the pupils attending the schools with Ukrainian being the only language of instruction. Among the latter pupils, 45,700 (or 18% of the total) study the Russian language as a separate subject in the largely Russophone Ukrainian capital, although an estimated 70 percent of Ukraine's population nationwide consider that Russian should be taught at secondary schools along with Ukrainian. The Russian Cultural Center in Lviv has been attacked and vandalized on several occasions. On January 22, 1992 it was raided by UNA-UNSO led by the member of Lviv Oblast Council. UNA-UNSO members searched the building, partially destroyed archives and pushed people out from the building. Their attackers declared that everything in Ukraine belonged to the Ukrainians, so the Moskals and the kikes were not allowed to reside or have property there. The building was vandalized during the Papal Visit to Lviv in 2001, then in 2003 (5 times), 2004 (during the Orange Revolution), 2005, 2006. 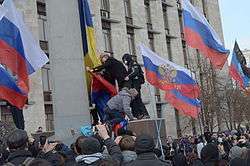 Pro-Russian protesters remove a Ukrainian flag and replace it with a Russian flag in front of the Donetsk Oblast Regional State Administration building during the 2014 pro-Russian conflict in Ukraine. After the Euromaidan events, regions with a large ethnic Russian population started anti-Maidan protest and separatist activity. After the new government cancelled the Legislation on languages in Ukraine, which allowed Russian language to be used on official level in areas where Russian-speakers formed a majority. The Supreme Council of Crimea announced the Crimean referendum, 2014, and sent a request to Russia to send military forces into the Crimea to "protect" the local population from the right-wing Euromaidan protesters, which marked the beginning of the 2014 Crimean crisis. Major Anti-Maidan protests took place in other Russian speaking major cities like Donetsk, Odessa, and Kharkiv. The council of the Donetsk Oblast voted to have a referendum to decide the future of the oblast. The anti-Maidan protests evolved into the 2014 pro-Russian conflict in Ukraine. The result of the Crimean referendum, 2014 was 97.47% for joining the Russian Federation. The pro-Russian protests in Donetsk and Luhansk oblasts of the 2014 pro-Russian conflict in Ukraine escalated into an armed separatist insurgency. This led the Ukrainian government to launch a military counter-offensive against the insurgents in April 2014, which resulted in the ongoing War in Donbass. During this war heavy shelling accorded in Luhansk and Donetsk, cities with a large ethnic Russian population. According to the United Nations, 730,000 refugees from the Donetsk and Luhansk oblasts have fled to Russia since the beginning of 2014. By late September 2015 nearly 8,000 people had died in the two oblasts because of the War in Donbass. In total, according to a 2007 country-wide survey by the Institute of Sociology, only 0.5% of the respondents describe as belonging to a group that faces discrimination by language. Furthermore, in a poll held October 2008, 42.8% of the Ukrainian respondents said they regard Russia as “very good” while 44.9% said their attitude was “good" (87% positive). According to the Institute of Sociology surveys conducted yearly between 1995 and 2005, the percentage of respondents who have encountered cases of ethnic-based discrimination against Russians during the preceding year has consistently been low (mostly in single digits), with no noticeable difference when compared with the number of incidents directed against any other nation, including the Ukrainians and the Jews. According to the 2007 Comparative Survey of Ukraine and Europe only 0.1% of Ukrainian residents consider themselves belonging to a group which is discriminated by nationality. Similarly, the surveys indicate that Russians are not socially distanced in Ukraine. The indicator of the willingness of Ukraine's residents to participate in social contacts of varying degrees of closeness with different ethnic groups (the Bogardus Social Distance Scale) calculated based on the yearly sociological surveys has been consistently showing that Russians are, on the average, least socially distanced within Ukraine except the Ukrainians themselves. The same survey has shown that, in fact, that Ukrainian people are slightly more comfortable accepting Russians into their families than they are accepting Ukrainians living abroad. Such social attitude correlates with the political one as the surveys taken yearly between 1997 and 2005 consistently indicated that the attitude to the idea of Ukraine joining the union of Russia and Belarus is more positive (slightly over 50%) than negative (slightly under 30%). The ultra-nationalist political party "Svoboda" has invoked radical Russophobic rhetoric and has electoral support enough to garner majority support in local councils, as seen in the Ternopil regional council in Western Ukraine. Oleh Tyahnybok, the leader of the "Svoboda" party, urged his party to fight "the Moscow-Jewish mafia" ruling Ukraine. "Svoboda" members held senior positions in Ukraine's government in 2014. But the party lost 30 seats of the 37 seats (its first seats in the Ukrainian Parliament) it had won in the 2012 parliamentary election in the late October 2014 Ukrainian parliamentary election and did not return to Ukraine's government. According to 2006 survey by Research & Branding Group (Donetsk) 39% of Ukrainian citizens think that the rights of the Russophones are violated because the Russian language is not official in the country, whereas 38% of the citizens have the opposite position. According to annual surveys by the Institute of Sociology of the National Academy of Sciences 43.9% to 52.0% of the total population of Ukraine supports the idea of granting the status of state language to Russian. At the same time, this is not viewed as an important issue by most Ukraine's citizens. On a cross-national survey involving ranking the 30 important political issues, the legal status of the Russian language was ranked 26th, with only 8% of respondents (concentrated primarily in Crimea and Donetsk) feeling that this was an important issue. Russian continues to dominate in several regions and in Ukrainian businesses, in leading Ukrainian magazines, and other printed media. Russian language in Ukraine still dominates the everyday life in some areas of the country. On February 23, 2014, the Ukrainian parliament adopted a bill to repeal the law on minority languages, which—if signed by the Ukrainian President—would have established Ukrainian as the sole official state language of all Ukraine, including Crimea which is populated by a Russian-speaking majority. Repeal of the law was met with great disdain in Southern and Eastern Ukraine. The Christian Science Monitor reported: "The [adoption of this bill] only served to infuriate Russian-speaking regions, [who] saw the move as more evidence that the antigovernment protests in Kiev that toppled Yanukovich's government were intent on pressing for a nationalistic agenda." A proposal to repeal the law was vetoed on 28 February 2014 by acting President Oleksandr Turchynov. Some authors born in Ukraine who write in the Russian language, notably Marina and Sergey Dyachenko and Vera Kamsha, were born in Ukraine, but moved to Russia at some point. In general the population of ethnic Russians in Ukraine increased due to assimilation and in-migration (colonization) between 1897 and 1939 despite the famine war and Revolution. Since 1991 it has decreased drastically in all regions, both quantitatively and proportionally. Ukraine in general lost 3 million Russians, or a little over one-quarter of all Russians living there in the 10-year period between 1991 and 2001, dropping from over 22% of the population of Ukraine to just over 17%. In the past 15 years since 2001, a further drop of Russian numbers has continued. Several factors have affected this – most Russians lived in urban centres in Soviet times and thus were hit the hardest by the economic hardships of the 1990s. Some chose to emigrate from Ukraine to (mostly) Russia or to the West. Finally some of those who were counted as Russians in Soviet times declared themselves Ukrainian during the last census. The Russian population is also hit by the factors that affected all the population of Ukraine, such as low birth rate and high death rate. 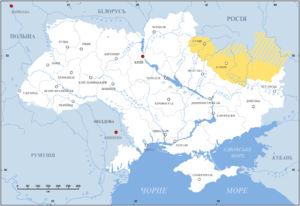 2001 census showed that 95.9% of Russians in Ukraine consider the Russian language to be native for them, 3.9% named the Ukrainian to be their native language. The majority, 59.6% of Ukrainian Russians were born in Ukraine. They constitute 22.4% of all urban population and 6.9% of rural population in the country. Women make up 55.1% of Russians, men are 44.9%. The average age of Russians in Ukraine is 41.9 years. The imbalance in sexual and age structure intensifies in western and central regions. In these regions the Russians are concentrated in the industrial centers, particularly the oblast centres. The majority of the Russians are Christians of the Eastern Orthodox Faith and predominantly belong to the Ukrainian Orthodox Church, a former Ukrainian exarchate of the Russian Orthodox Church, which received an ecclesiastical Autonomy from the latter on October 27, 1990. There are small minorities of Old Believers, notably Lipovans, as well as Protestants and Catholics among Russians. In addition, there is a sizable portion of those who consider themselves atheists. Results of the 2007 parliamentary election showed that the Party of Regions maintained a stronghold in the southern and eastern regions. 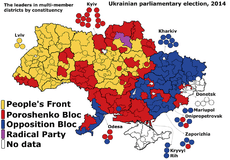 Results of the 2014 parliamentary election show that the Party of Regions successor Opposition Bloc was overrun by the non-pro-Russian Petro Poroshenko Bloc in southern regions. Political parties whose electoral platforms are crafted specifically to cater to the Russian voters' sentiments fared exceptionally well. Until the 2014 Ukrainian parliamentary election several of Ukraine's elections, political parties that call for closer ties with Russia received a higher percentage of votes in the areas where Russian-speaking population predominate. Parties like the Party of Regions, Communist Party of Ukraine and the Progressive Socialist Party were particularly popular in Crimea, Southern and Southeastern regions of Ukraine. In the 2002 parliamentary election, the mainstream Party of Regions, with a stronghold based on Eastern and Southern Ukraine came first with 32.14%, ahead of its two nationally conscious main rivals, the Yulia Tymoshenko Bloc (22.29%) and Our Ukraine Bloc (13.95%), while also Russophile Communist Party of Ukraine collected 3.66% and the radically pro-Russian Nataliya Vitrenko Bloc 2.93% coming closest of the small parties to overcoming the 3% barrier. In the 2007 parliamentary election, the Party of Regions came first with 34.37% (losing 130.000 votes), the Yulia Tymoshenko Bloc second with 31.71% (winning 1.5 million votes), the Our Ukraine–People's Self-Defense Bloc third with 14.15% (losing 238,000 votes), the Communist Party of Ukraine fourth with 5.39% (winning 327,000 votes) while the Nataliya Vitrenko Bloc dropped to 1.32%. Although the Yulia Tymoshenko Bloc attracted most of its voters from Western Ukrainian, Ukrainian-speaking provinces (Oblasts), it had in recent years recruited several politicians from Russian-speaking provinces like Crimea (Lyudmyla Denisova) and Luhansk Oblast (Natalia Korolevska). In the 2012 parliamentary election Party of Regions again won 30% and the largest number of seats while Fatherland (successor to Yulia Tymoshenko Bloc) came second with 25.54%. The Communist Party of Ukraine raised its percentage of the votes in this election to 13.18%. In the 2014 parliamentary election the Party of Regions successor Opposition Bloc was overrun by the non-pro-Russian Petro Poroshenko Bloc in southern regions. In the election Opposition Bloc scored 9.43%, finishing fourth. Opposition Bloc gained most votes East Ukraine, but scored second best in former Party of Regions stronghold South Ukraine (trailing behind Petro Poroshenko Bloc). The Communist Party of Ukraine was eliminated from representation in the election because it failed to overcome the 5% election threshold with its 3.87% of the votes. Because of the War in Donbass and the unilateral annexation of Crimea by Russia elections were not held in Crimea and also not in large parts of Donbass, both were before stronghold of the Party of Regions and the Communist Party of Ukraine. Whereas there are several political parties and movements in Ukraine that advocate a moderate pro-Russian policy, there are also a few pro-Russian political organizations that are considered radical by observers. Many of them state their agenda as an opposition to Ukrainian independence and openly advocate for the restoration of the Russian Empire. These movements are numerically small, but their impact on the society is easy to overestimate due to their vocal activity that generates much media coverage and commentary from politicians at the highest levels. The actions organized by these organizations are most visible in the Ukrainian part of historic Novorossiya (New Russia) in the south of Ukraine and in the Crimea, a region in which in some areas Russians are the largest ethnic group. As ethnic Russians constitute a significant part of the population in these largely Russophone parts of southern Ukraine (and a majority in the Crimea), these territories maintain particularly strong historic ties with Russia on the human level. Thus, a stronger than elsewhere in the country pro-Russian political sentiment makes the area a more fertile ground for the radical pro-Russian movements that are not as common elsewhere in the country. As of December 2009 clashes between Ukrainian nationalists and pro-Russian organisations do sometimes take place. Among such movements are the youth organizations, the Proryv (literally the Breakthrough) and the Eurasian Youth Movement (ESM). Both movements' registration and legal status have been challenged in courts; and the leader of Proryv, a Russian citizen, was expelled from Ukraine, declared persona non grata and barred from entering the country again. Alexander Dugin, the Moscow-based leader of the ESM and his associate Pavel Zariffulin have also been barred from travelling to Ukraine because of their involvement in the activities of these organizations, although bans have been later lifted and reinstated again. These movements openly state their mission as the disintegration of Ukraine and restoration of Russia within the borders of the former Russian Empire and, reportedly, have received regular encouragement and monetary support from Russia's politically connected businessmen. These organizations have been known not only for their pro-Russian activities, but have been also accused of organising massive acts of protest. The pro-Russian organization Proryv was involved in the 2006 anti-NATO protests in Crimea. This photo taken on June 11, 2006 in Feodosiya features typical for this organization protesters' banners with pro-Russian and anti-Western rhetoric. Banners claim the solidarity of Bakhchisaray, Kerch, Odessa, Kharkov (Kharkiv) with Feodosian protesters. Others say: "The future of Ukraine is in the union with Russia", "Crimea and Russia: the strength lies in unity", "Russia – friend, NATO – enemy", "Shame to traitors." Some observers point out the Russian government and the Russian Orthodox Church's support of these movements and parties in Ukraine, especially in Crimea. The publications and protest actions of these organizations feature strongly pro-Russian and radically anti-NATO messages, invoking the rhetoric of "Ukrainian-Russian historic unity", "NATO criminality", and other similar claims. Some observers link the resurgence of radical Russian organizations in Ukraine with Kremlin's fear that the Orange Revolution in Ukraine could be exported to Russia, and addressing that possibility has been at the forefront of these movements' activities. As a branch of a similar Russian organization the Eurasian Youth Union (ESM) has been organizing annual Russian Marches. The November 2006 "Russian march" in Kiev, the capital, gathered 40 participants, but after the participants attacked the riot police, it was forced to interfere and several participants from were arrested. In Odessa and Crimean cities the November 2006 "Russian marches" drew more participants, with 150–200 participants in Odessa, and 500 in Simferopol and went more peacefully. The marchers were calling for the Ukrainian and Russian Orthodox Church unity as well as the national unity between Russia and Ukraine. In Odessa the march of about 200 people carried anti-Western, pro-Russian slogans and religious symbols. Human Rights Public Movement "Russian-speaking Ukraine", a non-governmental organisation based in Ukraine. 1 2 3 4 5 6 7 8 "Results / General results of the census / National composition of population". 2001 Ukrainian Census. Retrieved May 20, 2007. 1 2 In the 2003 sociological survey in Kiev the answers to the question 'What language do you use in everyday life?' were distributed as follows: 'mostly Russian': 52%, 'both Russian and Ukrainian in equal measure': 32%, 'mostly Ukrainian': 14%, 'exclusively Ukrainian': 4.3%. "What language is spoken in Ukraine?". Welcome to Ukraine. 2003/2. Check date values in: |date= (help). ↑ "Why Eastern Ukraine is an integral part of Ukraine". ↑ 1897 Census on Demoscope.ru Retrieved on 20th May 2007. ↑ Stanislav Kulchitsky, "Empire and we", Den, Vol. 9, 26 Jan. 2006. Retrieved on 7 December 2014. ↑ Valeriy Soldatenko, "Donetsk-Krivoy Rog Republic — illusions and practicals of nihilism", Zerkalo Nedeli, December 4–10, 2004. In Russian, in Ukrainian. ↑ Терлюк І.Я. Росіяни західних областей України (1944—1996 р.р.) (Етносоціологічне дослідження). — Львів: Центр Європи, 1997.- С.25. ↑ "Tatars push to regain their historic lands in Crimea". Today's Zaman. March 31, 2006. Retrieved March 31, 2007. ↑ "Как соблюдается в Украине языковая Хартия?". 21 September 2007. Retrieved 23 October 2014. ↑ According to a 2006 survey, Ukrainian is used at home by 23% of Kievans, as 52% use Russian and 24% switch between both. ↑ ГАНЕБНА ВИТІВКА Archived January 7, 2008, at the Wayback Machine. ↑ "На Украине разгромили помещение Российского культурного центра". ИА REGNUM. Retrieved 23 October 2014. ↑ Русский культурный центр во Львове расписали нехорошими словами Archived March 28, 2008, at the Wayback Machine. ↑ "Російський культурний центр став помаранчевий". portal.lviv.ua. Retrieved 23 October 2014. ↑ Чия рука тягнеться по камінь? Archived June 25, 2008, at the Wayback Machine. ↑ Вчинено черговий акт вандалізму на Російський культурний центр у Львові Archived January 7, 2008, at the Wayback Machine. ↑ Lina Kushch (3 December 2013). "Donetsk view: Ukraine 'other half' resents Kiev protests". BBC News. ↑ "Донецкий облсовет проголосовал за референдум". Gazeta.ua. Retrieved 2014-03-03. ↑ "В Донецке несколько сотен радикалов с криками "Россия" штурмуют ОГА". Gazeta.ua. Retrieved 2014-03-03. ↑ "Облсовет Луганская угрожает разоружить Майдан руками "братской" России". Gazeta.ua. Retrieved 2014-03-02. ↑ Grytsenko, Oksana (12 April 2014). "Armed pro-Russian insurgents in Luhansk say they are ready for police raid". Kyiv Post. ↑ Peter Leonard (13 April 2014). "Kiev government to deploy troops in Ukraine's east". Yahoo News. Associated Press. Retrieved 14 April 2014. ↑ "Russia accuses the West of pushing Ukraine into 'fratricidal war' as Chechen leader denies sending troops to help pro-Moscow forces". Daily Mail. 28 May 2014. Retrieved 1 June 2014. ↑ "In Shell-Torn Luhansk, Food and Water Is Scarce: 'Welcome to Hell!'". Newsweek. 15 August 2014. ↑ "East Ukraine city of Luhansk dying under siege, residents say". The Denver Post. 5 August 2014. ↑ "About 730,000 have left Ukraine for Russia due to conflict - UNHCR". Reuters. August 5, 2014. ↑ "Svoboda Fuels Ukraine’s Growing Anti-Semitism". Algemeiner Journal. 24 May 2013. ↑ "Ukraine's revolution and the far right". BBC News. 7 March 2014. 1 2 Ukraine election:President Yanukovych party claims win, BBC News (29 October 2012). ↑ Большинство украинцев говорят на русском языке, Podrobnosti, December 04, 2006. ↑ Громадський рух — Не будь байдужим. Ще не вмерла Україна ... круглий стіл. ↑ "TOLERANCE REDUCES NEED FOR RUSSIAN LANGUAGE LAW IN UKRAINE". Eurasia today. Archived from the original on September 30, 2007. Retrieved July 5, 2007. ↑ Traynor, Ian (24 February 2014). "Western nations scramble to contain fallout from Ukraine crisis". The Guardian. ↑ Ayres, Sabra (February 28, 2014). "Is it too late for Kiev to woo Russian-speaking Ukraine?". The Christian Science Monitor. ↑ "Ukraine's parliament-appointed acting president says language law to stay effective". ITAR-TASS. 2014-03-01. ↑ "Всеукраїнський перепис населення 2001 - English version - Results - General results of the census - National composition of population:". Retrieved 23 October 2014. ↑ Определение Архиерейского Собора Русской Православной Церкви 25 – 27 октября 1990 года об Украинской Православной Церкви Archived June 17, 2009, at the Wayback Machine. 1 2 Central Election Commission of Ukraine Archived October 11, 2007, at the Wayback Machine. ↑ "Ukraine elections: Runners and risks". BBC News. 22 May 2014. Archived from the original on 27 May 2014. Retrieved 29 May 2014. ↑ Центральна виборча комісія України - WWW відображення ІАС "Вибори народних депутатів України 2012"
"CEC substitutes Tymoshenko, Lutsenko in voting papers". 30 August 2012. Archived from the original on 13 August 2014. Retrieved 6 November 2015. ↑ "Leftist, pro-Russian extremists defy Yushchenko over history". Retrieved 23 October 2014. ↑ "СБУ собирается ликвидировать пророссийские радикальные организации в Крыму через суд.". Новости Луганска и Луганской области. Луганские новости сегодня. Retrieved 23 October 2014. ↑ Крым негостеприимно встретил НАТО: американцам всю ночь пришлось искать ночлег, NEWSru.com, June 2, 2006. ↑ Andriy Okara, "New Ukrainian Oprichnina, or what is in common "Pora", neoeuro-Asians, Ivan the Terrible and Yulia Tymoshenko", Zerkalo Nedeli, March 12–18, 2005. In Russian, in Ukrainian.